EMPs are potentially one of the most destructive weapons that could be used against today’s society. Just a single nuclear bomb detonated at high altitude over a major city could wipe out all electronics for potentially thousands of miles around. 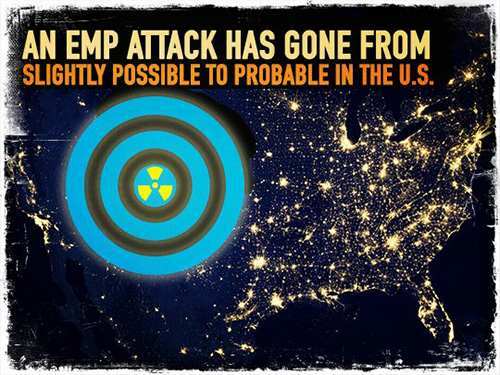 If you find yourself the victim of an EMP attack, you’re likely going to be living in the dark ages for quite a while. All the skills that came so naturally to our ancestors like hunting, fishing, trapping, and growing food will have to be sharpened, if not re-learned completely. So, here are 5 things you need to do when there’ll be no rule of law. We often lose track of just how many machines and services run on electricity nowadays. Almost every aspect of modern life is influenced or controlled by electronics, and they’re all vulnerable – so life after an electromagnetic pulse attack would be a lot different from what we’re used to. Long distance communication would be difficult, if not impossible. So, here’s how to make a tin can directional WiFi antenna to extend your communication after an EMP. Similar to life in an Amish community, we would have to start over from scratch and make do with only mechanical tools. That is of course unless you’re able to store a disassembled, complete electrical power generation system for your home inside something like a Faraday cage. What does it take to defend against an EMP? A Faraday cage is an enclosed space that is completely shielded from the effects of an EMP – whether that be a small box covered with aluminum foil, or an entire shipping container fortified to withstand an EMP attack. Obviously, if you want to fit something as big as a home electrical generation system inside of your Faraday cage, you need a big space to do it in. You could store electronics you don’t want to be compromised in it as well, but without the ability to generate your own electricity these devices won’t do you much good. Thus, you need a buried shipping container big enough to accommodate such a system, and the right reinforcements to keep everything inside protected from an EMP. How Exactly Should I Reinforce My Shipping Container? The fact that your shipping container is already a few inches in the ground already means that it’s grounded. It needs to be grounded so the EMP will flow through the soil with the least resistance, the same way a lightning strike would. Being grounded will also help remove potential stray fields that could be present. Depending on what the shipping container is made out of, you won’t need to do a whole lot of sealing up. You’ll likely want to flip it upside down though. The roof is thicker than the floor, and you want a thicker floor to prevent warping of the container when it settles in the ground. Once it’s in the ground you can fill it up with the electronics that you want to protect. The shipping container itself should work as long as it’s sealed up, but if you want to you can nest some containers inside. Nesting is similar to Russian nesting dolls, except with Faraday cages. It’s putting cages inside of cages inside of cages. Ammunition boxes work for this, as well as microwaves and metal trashcans with sealed lids. For sealing up the doors, some people choose to simply create a stainless steel or copper mesh wall over the door. This can then be easily broken down once you need to get back into the container. You could also choose to solder the door shut completely which would be the safest option, but likely unnecessary. Door seals made of copper braiding will also do the trick. One thing to remember about storing stuff inside your shipping container is that all the items need to be kept away from the metal walls. The walls of a Faraday cage exposed to EMP will carry a pretty substantial current while the pulse lasts, and anything in contact with them is probably going to get damaged. The floor counts as well, so you’ll want to lay down some thick carpet or rugs. Buying a shipping container with a wooden floor would also work, as long as nothing inside is touching the metal of your container. It’s not necessary to use a full shipping container as a Faraday cage unless you intend to use all of that space. As stated before, using it to store a full disassembled power generation system is your best bet if you want to have electricity after an EMP attack. It’s also a good idea to store something like a motorcycle or a four-wheeler in one of these. You could even store a full truck or car in yours, but a motorcycle or similar sized vehicle will take up much less space. If you intend to solder your doors shut, make sure you have the right tools to get it open in case of an EMP attack. There’s a quick and easy test to see if your container is completely EMP proof. Simply place a cell phone inside the container, and close it up. Then as you’re standing outside the container, call your cell phone from another phone. Place your ear to the container and see if you can hear it ringing. If you CAN hear it ringing, your container will NOT protect your electronics from an EMP. If you can’t hear it working, there’s a good chance your container is EMP proof. This isn’t completely foolproof but it’s the only way to test your container without setting off an actual EMP. EMP attacks can be destructive and downright deadly if used on a wide enoughscale. In order to protect your electronics from an attack, you’ll need a Faraday cage. Placing a shipping container in the ground and sealing it up completely works as an excellent Faraday cage. It’s naturally grounded, and large enough to store very important items like vehicles or self-generating power equipment. In event of an attack, you will likely be the only one around for miles with any working electrical equipment, which puts you and your family at a huge advantage in an area that’s been plunged back into the dark ages.